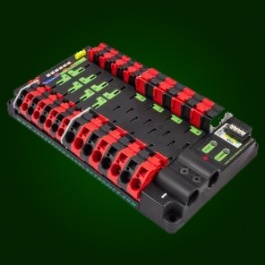 The Power Distribution Panel (PDP) is the latest DC power interface for competition robotics. The PDP uses CAN to connect directly to the roboRIO and allows for individual current monitoring on each channel. PDP also includes a PDP Hardware kit. Dimensions 7.586" X 4.748" X 1.422"